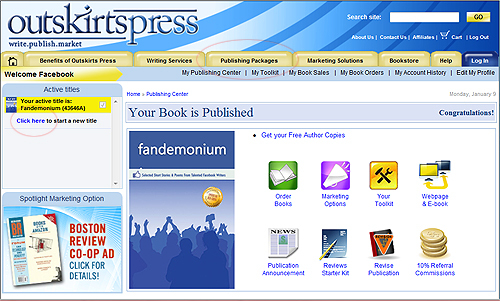 This dashboard allows me to manage my current publication, Fandemonium Volume 1. 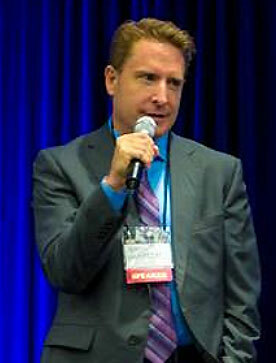 I can order books or marketing options, among other management tools. I can also start publishing a new book by clicking the “Click here” link circled along the left-hand side under my “Active Titles” list. If I am publishing my FIRST book with Outskirts Press, I would click the Publishing Packages button along the top menu tabs (circled above). 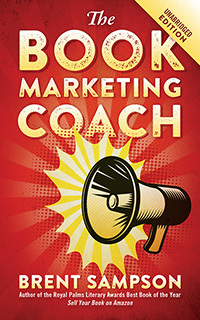 If I don’t know what book publishing package to order, I would order the “Down Payment on Book Publishing” option, which applies a small deposit toward the package I will eventually choose. It also gets my production team assigned so I can consult with my Publishing Consultant personally. Some authors assume they must pay this deposit in order to get help or speak with someone on the phone, but that’s not true. 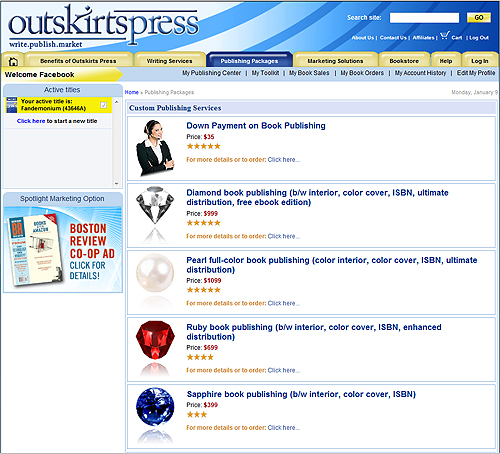 We open lines of email communication with every author who registers for a free Publishing Center from our site at http://outskirtspress.com/authors.php when they download our free e-books. And our toll free number is listed on just about every page of our website. But when it comes to priority and allocation of available resources (people), it’s probably easy to understand why someone who has paid a down payment on their publishing package gets more attention than someone who has not. So here are some hints to skip the Down Payment and go straight to a publishing package, where all the Outskirts Press service really kicks in: If you have any color inside your book, you need the Pearl package; it’s as easy as that. All of our covers are full-color, so this consideration is solely related to the interior of the book. If your interior is black/white, you have more choices, although over 60% of all our authors choose the Diamond package and about 25% select the Ruby. 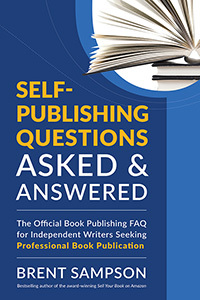 Here’s why: The Emerald doesn’t include an ISBN nor distribution (less than 2% of our authors choose this one), and the Sapphire is pretty limited in terms of available formats and options (less than 5% choose this one). Not to get too complicated, but in this chart, you’ll notice that competitive publisher “U” pays less royalties than the Diamond or Ruby package but more than the Sapphire package for this example book. But keep in mind Publisher U’s retail price in this example is also $4 higher.